Those of you who have read my blogs since the 365 Bar Crawl will remember that my co-pilot for that journey was Al Rizo, a friend and commenter who lives in Miami and had a knack for finding great bars for me to go to. “Boris” even made up a banner to fly the nights we went to one of Al’s picks. Al always picked a winner and he’s found some possible gems already for me to check out here in Peoria. Since I’ve been to almost every bar in Peoria, most of the one’s he’s suggested I knew about, but it’s always nice to get a reminder. Al has uncovered one spot I’ve never been to and it looks like a winner. In fact I glanced in the window last Saturday, because it’s right next door to Judge’s Chambers, where I went for this week’s Saturday Night Cheeseburger. So I decided that would be this week’s Sunday bar destination. Back in April, 2011, Jeremiah Moss wrote a post called, “Swizzle At Sardi’s,” that inspired me to start going out in search of swizzle sticks in New York. It started a life of it’s own and thanks to a lot of bars and generous readers and friends who donated swizzle sticks, I now have a huge collection. Check it out below. So I thought that I’d start looking for swizzle sticks in and around Peoria on my weekly Sunday drinking adventures. 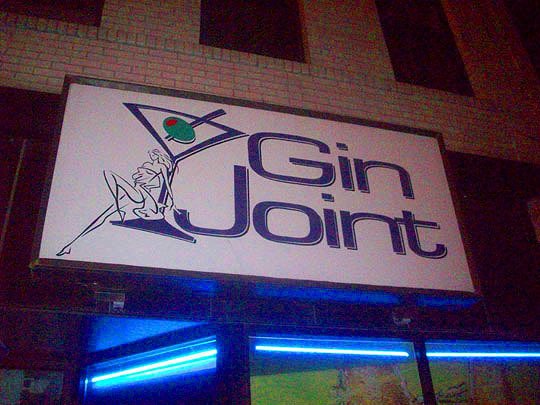 And now, it’s off to Al’s pick, the Gin Joint! I called a cab to deliver me to the bar. I plan on having more than a couple of drinks, and I'm not going to risk a D.U.I. I got one in 1989 and swore I'd never drive drunk again, and so it's off in the cab we go! It's time to take that lonely walk to another bar. Luckily I didn't have too long to walk. 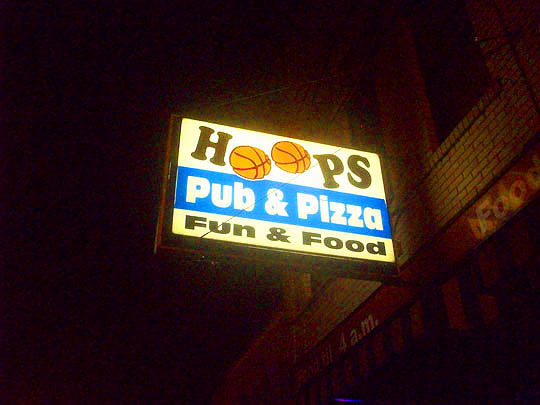 As I stated earlier, The Judge's Chambers is right next door and next door to them is this bar, Hoop's. The lights are on there's food here till 4 AM, so let's go check it out. There's nobody sitting at the bar, except that one guy looking at me wondering why I'm taking photos in here. Let's go snag a chair and see who he is. 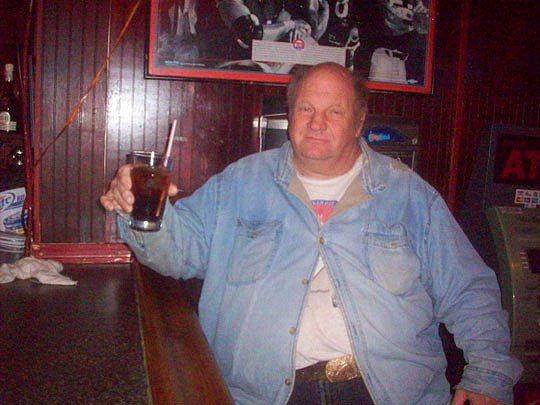 His name's David and he said he only has one beer when he goes out and then switches to soda because he's a truck driver. Well, that's exactly why I called a cab and here comes the first of many drinks served up by the lovely bartender, Maranda. There's a Maranda Rights/Judge's Chambers joke in there somewhere, but I don't want to think that hard, so I'm just going to let it go. Phil Spector had a wall of sound, but Hoops has a wall of booze. Impressive! Check out the drink prices in here, drinking in Peoria is a lot easier on the old pocketbook than New York, that's for sure! To Bradley basketball playing cards lacquered on to the top of this table. There's even a scoreboard in here, but Maranda said they don't turn it on because it's too bright. I asked if she'd turn it on for this photo and she told me no. A bit of a bitter disappointment, but I took this shot and soldiered on. There's tables up front and opposite the bar to sit and dine and drink at. Since it's Sunday, most of them are vacant. But the table behind the bar was filled with these gentlemen enjoying some of Hoops' legendary pizza. From left: Gordon, Andy, Dizzy and Todd. They told me they're working on the opening of a new dance club here in town called, Berlin. The place is going to be located up the street at 627 Main Street, so keep your eyes open for the grand opening soon. Maybe Terri Nunn will show up! If you don't feel like dining in, you can order and get it to go. And here's the patent-pending Spike's taps shot. A shot of the long wooden bar from the other end. As you can see, David has left, I think I scared him away with my incessant photo taking. Meanwhile back at the bar, Maranda and her co-worker, Brad are busy filling orders. Glancing up at the ceiling I see the mark of a great bar, a tin ceiling! I decided to check out the menu, even though I pretty much new what I wanted. I had heard they served slices of pizza in here, which if you live in New York is no big deal. You never have to walk more than a couple blocks to get a slice there, but here that's not the case. Restaurants and bars selling slices are few and far between, so I ordered up a cheese slice and another beer. 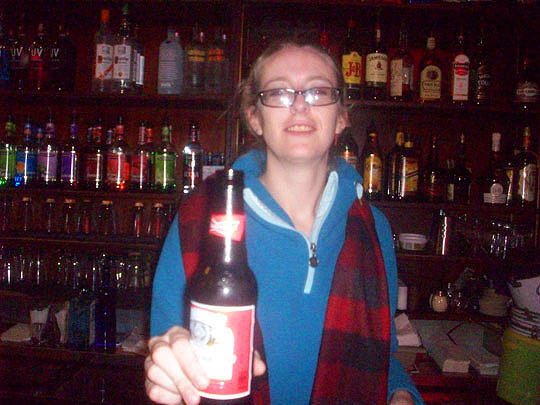 And through the magic of the internet, here's the aforementioned slice, dutifully served up by Maranda. The pizza here is homemade and it looks great! Delicious! Lots of cheese, thin crispy crust and a tangy, zippy sauce. Alright, now that I've got some food in my belly, time to order up a double gin and tonic and see if we score a swizzle stick! Wah, wah, waah! No swizzle stick, they use a straw. The good news is they make a potent double gin and tonic in here! Cheers! And head back home feeling glad I didn't drive or this last shot might've been a mugshot. See you all tomorrow! Further Reading: Peoria Bar Review, Insider Pages and facecrack. Basketball jones, I got a basketball jones.